These private, hands-on lessons are deeply relaxing. They will improve range of motion, biomechanics and overall comfort and function quickly using neuromuscular retraining. Through gentle touching and movement, the practitioner will communicate how to move in more expanded functional motor patterns. For example, a client with a repetitive stress injury (RSI) or carpal tunnel problems could utilize more support from her shoulders, ribs, pelvis and spine when she works on the computer, rather than just using her lower arms and wrists. Each lesson will be custom-tailored to your unique configuration at that particular moment and will never use any invasive or forceful procedure. 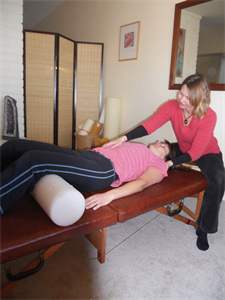 You will usually lie (fully clothed) on a table for your Functional Integration session, but some sessions may occur in sitting or even standing positions. At times, various props (rollers, padding, etc) will be used in an effort to support your body or to facilitate certain movements. ​Appointments available at my home studio (Grant/Silverbell) during the week for $90. Lessons are approximately 50-55 minutes. CALL 520.305.5393 to schedule your initial consultation or appointment today!